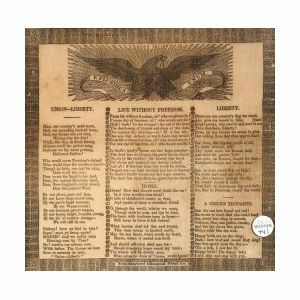 American Patriotic Textile, mid 19th century, printed in black on an off-white cloth depicting "Union-Liberty & Life Without Freedom", with poems and images of earlier patriots, New England Chemical Print Company, 10 1/4 by 10 1/2 in., framed. Federal Academy Painted Tiger Maple Work Table, together with a portrait "Imogine"
American School, 19th Century Pair of Hollowcut Portrait Silhouettes. American School, 19th Century Portrait of Two Sisters. American School, 19th Century Portrait Miniature of a Gentleman. 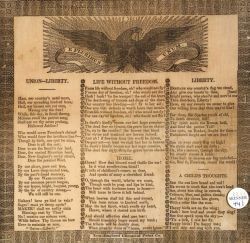 Possibly the Work of Mrs. Moses B. Russell (American, 1809-54) Two Little Girls with a Kitten. Moses Connor, Jr. (American, active 1800-1832) Birth Record of "Mary Hoyt Born May 6, 1807,"